You might want a true love spell if you are ready to find that certain soul-mate that you were meant to fall in love with. If you're not looking for that kind of commitment, then these aren't the spells for you. You can use thick yarn instead of the rope, but string just won't do. Tie a a knot in the center of the rope around the stem of the rose. Slide the two rings down the two ends of the rope up to the knot, and tie the rope again to secure them. 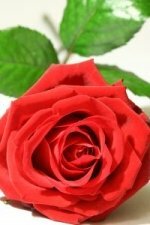 Put your hands together and focus your energy on the rose, and the true love you want to bring into your life. Repeat the words another 3 times. Leave the circle and rose on the floor for 1 week after that. You will need real pearls for this true love spell, and it draws on the strong element of water to get that love energy moving. On your altar, lay out the cloth, set the bowl on it and fill it up with water. Rain water is excellent if you have it, otherwise use some bottled or spring water. Hold the 3 pearls in your hands, and ask the Universe to bring you your one true love. Stand next to the bowl, and spin around once. Drop a pearl into the water, and watch until it settles to the bottom. Repeat the the next 2 pearls. Spoon out a little of the water, and drink it. Again, ask to have your soul mate brought into your life. Leave the bowl on your altar, until all of the water has evaporated. Don't be tempted to use a small bowl to speed this up. A larger bowl will give more energy to your spell and have better results. When there is no more water, carry the pearls with you. A few other spell options can be found on advanced love spells, or my page of love spells that work.